A great way of growing poppy seeds, especially those of Papaver somniferum, is by using seed trays. This allows you to germinate seeds in the right environment and ensure that they can be nurtured into strong and thriving plants. Growing individual plants in pots also means that you have the ability to create planting designs with flowers which is harder to do if seeds are sown straight into the ground. If you are using certain color combinations then you can simply label pots as plants are grown so that when planted out into the garden you can get the perfectly desired look. A major part of growing Papaver somniferum’s poppy seeds in seed trays is the process of pricking out. This is where, after the first few real leaves start to develop on seedlings, you need to carefully lift each individual plant and place it in its own pot. As seeds are so small you may find it hard to sow them evenly, meaning that many seedlings may start germinating in the same place. This results in lots of tiny roots competing for the same nutrients which will not aid the development of plants. By pricking seedlings out and placing them in their own pots you can ensure that as many plants as possible grow up large and healthy to give you the best display ever. Pricking out is easily done and all you need is a small pencil or chopstick to help. Never pull a seedling out by its stem as it can damage the plant. Gently holding a leaf, push your chopstick or pencil into the soil below the plant and slowly lift the seedling. This will allow the roots to slide out of the compost with as little disturbance as possible. For smaller seedlings you might like to plant several into one pot to conserve space, but as seedlings become larger then it is best to give individual plants their own soil and nutrients. After lifting each seedling, make a small hole into the new compost using the lifting utensil, slide the seedling in, firm the compost gently and give young plants a good water so that roots can settle into the soil. Watering will also help reduce the amount of air bubbles around the roots of seedlings. While the process of pricking out may seem time consuming and unneeded, if you want large and healthy plants it is necessary growing process if you are germinating seeds in seed trays. If lots of seedlings are left together you will find that, often than not, most resulting plants are weedy and do not flower that well. However, by potting each seedling on in its own compost you can ensure that each plant is nurtured separately. Plants can be potted on again and again until they reach a several inches in height and have a good base or roots. After this time your hard work will pay off as you plant specimens into the garden for stunning displays of flowers throughout the summer months. 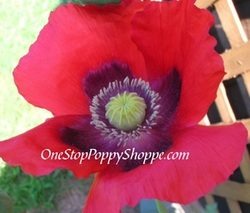 To buy poppy seeds online visit One Stop Poppy Shoppe for more than 75 varieties of these wonderful plants.